I love maps. Vanessa and I have maps on all the walls in our apartment - maps of Alaska, the USA, Africa and the World. As I'm planning to run along trails I've never been on before it seemed like the perfect opportunity to put up some new maps! 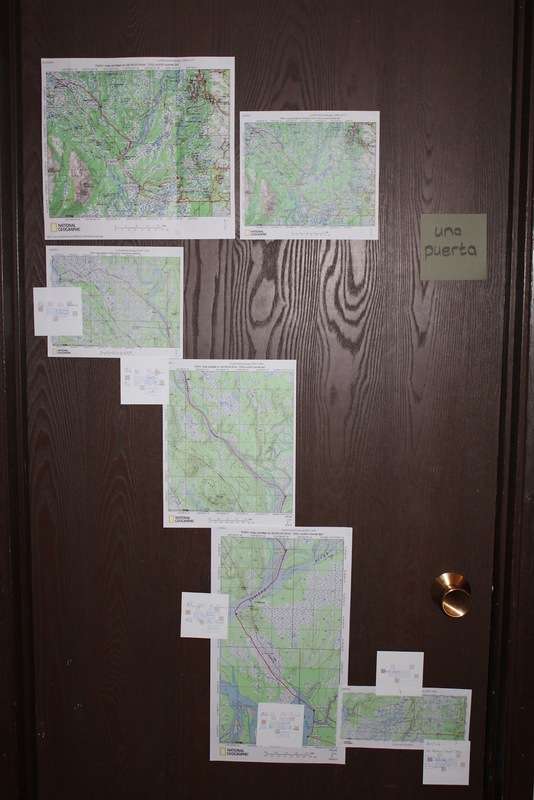 We now have three versions of the Susitna 100 trail on our bedroom door. The top two maps are overviews of the entire course: the larger one to see some of the details and the little one I'm taking with me. Below that the course is laid out in four different sections so I can plan where I'm going and what time I want to hit each check point. The mile markers and planned times are on the white post-it notes next to each section. The plan may be a little enthusiastic, but it's a useful reference to figure out and adjust along the way.